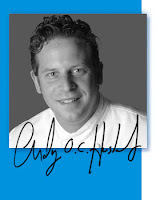 I don't watch reality tv, so I haven't seen any episodes of this season's Hell's Kitchen, but I may start - so I can root for our very own Andy Husbands. I ate brunch at Tremont 647 once while I lived in the South End. Usually I didn't make it that far down Tremont because I'd stop in at either Metropolis or Aquitaine before I made it to 647. I remember having lobster grits served by a dude wearing pajamas. I haven't been watching, does anyone know if he's still on the show? Click (here) to read the interview. 3 Response to "Andy Husbands on Hell's Kitchen"
There have only been 2 episodes and he's still on there so far. You have only missed one show and someone from the girl team was cut. So he is still in the running. Andy is still standing at the end of tonites show, 7/28. He got more "facetime" than he has the past few shows. I Am cheering him on! The show seems stressful but considering he runs a very successful restaurant he should hang in for more shows...lots of fun to watch! LOL!